A hotel is a place of rest, relaxation, rejuvenation and a celebration of life’s greatest achievements and moments. Your patrons deserve the ideal atmosphere to gather, enjoy and be treated to the finest pleasures. Hotel windows provide views of beaches, oceanfronts, vistas and city landscapes. 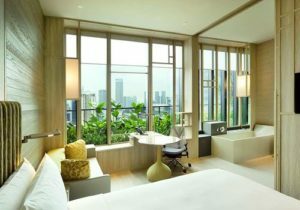 That’s why hotel windows need to have just as much appeal as furnishings and accessories and patrons need protection from harmful and damaging UV rays. Decorative Window Film is the best way to cut glare and add privacy to hotel windows while protecting customers from heat and damage to furnishings and belongings. Our decorative window film also protects hotel property with safety and anti-graffiti film lines. Constructed from the highest quality materials, window film tint installation in Toronto is an innovative approach to preserving hotel interiors and maintaining privacy and security.